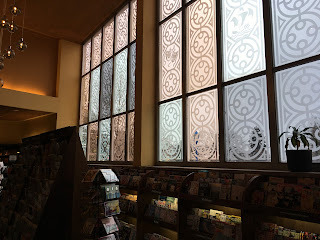 Yesterday I braved icy roads (treacherous enough that Highway 36 between Boulder and Denver was closed for three solid hours from multiple wrecks) for a lovely morning at the glorious Tattered Cover store on Colfax Avenue in Denver. The new co-owner, Kristen Gilligan, is excited about working with local authors to create an even more thriving writing community, and so she emailed me with an invitation to join her for coffee at this remarkable branch of this legendary store. The Tattered Cover first opened in 1971; its several branches together now stock half a million books. I especially love the branch in LoDo, the area of Denver right next to Union Station. I've made special trips on the bus to Denver just to sit there and write. 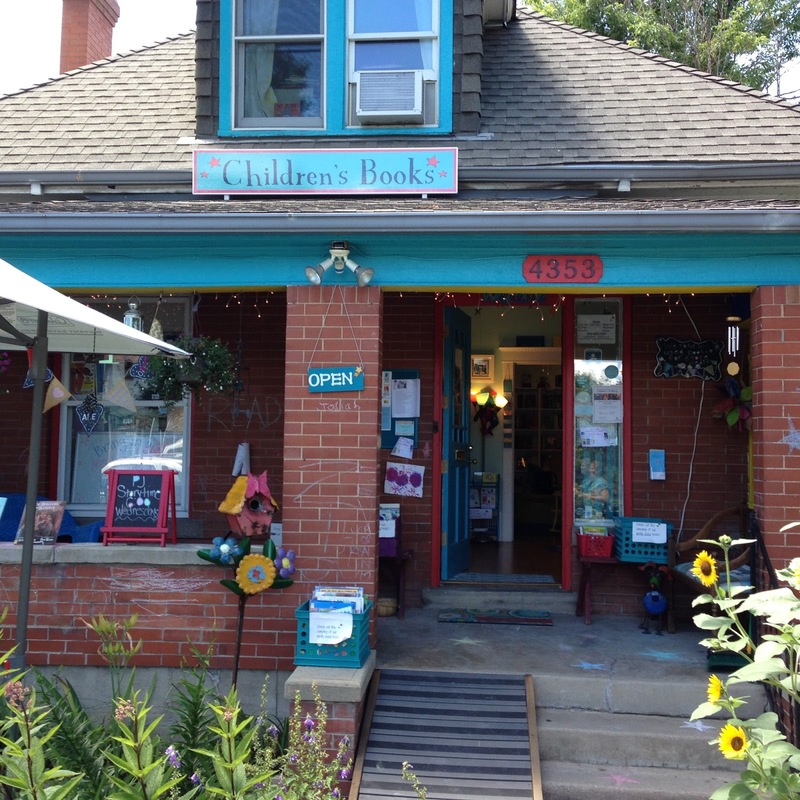 The Colfax store often hosts the Denver Children's Book Authors salon, and it's currently the largest and most beautiful. The store is situated in an old and very grand former theater with soaring windows in the front. It even retained some of the theater seating. 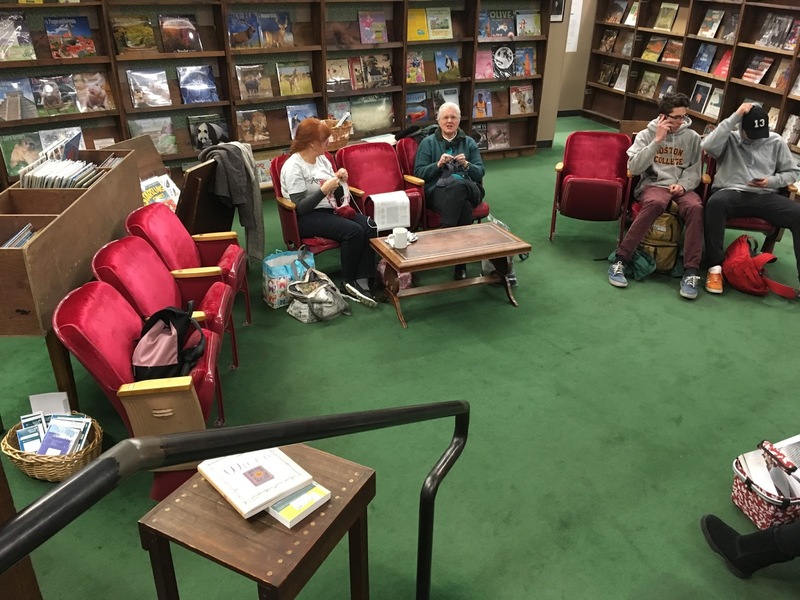 Here a knitting group sits cozy in those red-plush theater chairs. Kristen took me on a tour of the store, showing all the various theatrical elements that remain, from red velvet curtains hanging on one wall to a puppet theater in the well-stocked children's area. She also led me through the bowels of the store where the busy staff have their offices, so I could glimpse the inner workings of a store of this scale.There is magic in seeing how and where and magic happens. 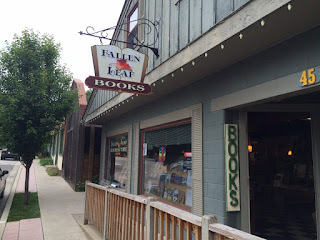 So hooray for local independent bookstores like the Tattered Cover, as well as Denver's treasure of children's bookstore (Second Star to the Right), our own Boulder Bookstore here on Pearl Street, and the wondrously eclectic Fallen Leaf Books owned by my sister and her husband in charming Nashville, Indiana. And hooray for booksellers who want to partner with local authors so that we can make book magic together. The story of an author's life is rejection. At the very least, any author's life is going to have a considerable amount of rejection in it: rejection of manuscripts by editors, rejection of published projects by disparaging reviewers, rejection of even critically acclaimed work by some reader somewhere who just doesn't love our book, story, article, or poem. I've had rejection throughout my long career. You could say that I got my start as a published author by getting rejections. . . from myself. When I worked as an editorial secretary at Scholastic almost 40 years ago, I submitted manuscripts to Scholastic under a pseudonym - and I was the one who had to type my own rejection letters. Over the intervening decades plenty of projects have been turned down even by editors who loved me. I've gotten my share of hurtful reviews, including one from The New York Times so scathing that friends all around the country sent me messages of condolence. I am hardly a stranger to rejection. But lately it seems that I'm getting more rejections than ever before. Part of the reason is that it's simply tougher to get a book published these days. I used to be able to get a contract for a book from a one-page synopsis if my editor was enthusiastic enough about it. Nowadays, awakening an editor's enthusiasm is just the first of many hurdles that have to be cleared: editorial enthusiasm; approval at a meeting of the entire editorial staff; approval from the editor-in-chief; and then approval at an acquisitions committee meeting at which marketing and sales staff are also present. And nowadays, there are so venues through which authors receive reviews, such as the website Goodreads, where thousands of strangers can weigh in on the merits of one's work. The people who decades ago would have hated a book of mine in private can now voice their hatred in public - and do. The world has simply become a more rejecting place. But part of the reason I'm getting more rejections than ever before may have to do with me. I'm getting older. This doesn't mean I'm getting fail and feeble! But it may mean that I'm getting not just old, but old-fashioned, clinging to a literary style shaped by the books of the mid-20th-century I so loved when I was a child. I need to keep on growing and changing. But getting older can also mean getting a teensy bit, well, more tired, and also maybe a teensy bit more accepting of that fact that I'm unlikely ever to write the Great American Novel - a teensy bit more contented with the modest-but-lovely success I've had. 5) rejection of a proposal to speak at a Society of Children's Book Writers and Illustrators conference. 1) I just received a rejection on ANOTHER proposal for a chapter book series from the same publisher. I still don't have that contract in hand. WAH! 2) The journal article has been published, much better for yet another round of revisions, and I'm enormously proud of it: "'Better Times Are Coming Now for All People': Wartime Dreams and Disillusionment in Rufus M."is now available in Children's Literature in Education. 4) I was invited back to that same festival for this spring even though the festival now has a new director - and is now paying attending authors twice as much as before. 5) I just presented a talk at the Denver Children's Book Authors Salon that was probably the best talk on craft I've ever given. So: one rejection (the most important one, alas!) is still haunting me. I rebounded from the other four just fine. 2017 has already brought me two painful rejections, both on book projects. I can't say I'm not worried. I am. Rejection is just part of an author's life. And it just so happens that I am an author. 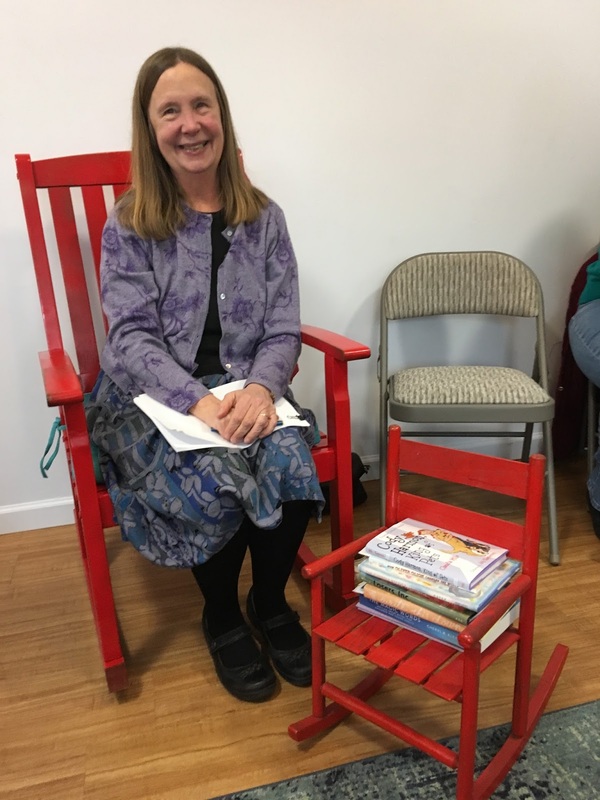 When I first moved to Colorado twenty-five years ago, I didn't think we had much of a children's book community here, compared to the fabulous opportunities provided by the Children's Book Guild of Washington, D.C., of which I remain a (non-resident) member to this day. My fellow members included Katherine Paterson, Phyllis Reynolds Naylor, and Mary Downing Hahn, and they were all so amazingly warm and welcoming to me and other newbie authors. 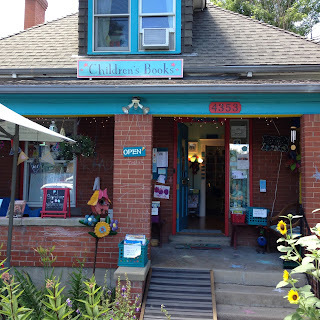 Best of all, we now have the Denver Children's Book Authors Salon. It began with a chance remark from one author (I don't even remember who it was): "Wouldn't it be great if we could just get together sometimes and learn from each other?" Not at a big conference, not at a formal class, just a few of us who deeply admire each others' books hanging out for an afternoon to grow in our craft by learning from the best masters around, that is to say, us. And then the incomparably generous Sarah Azibo simply took it upon herself to make it happen. Here's how the salons work. Once a month or so, on a Sunday afternoon, we meet at a lovely independent bookstore, rotating among stores because there are so many we love and want to support. 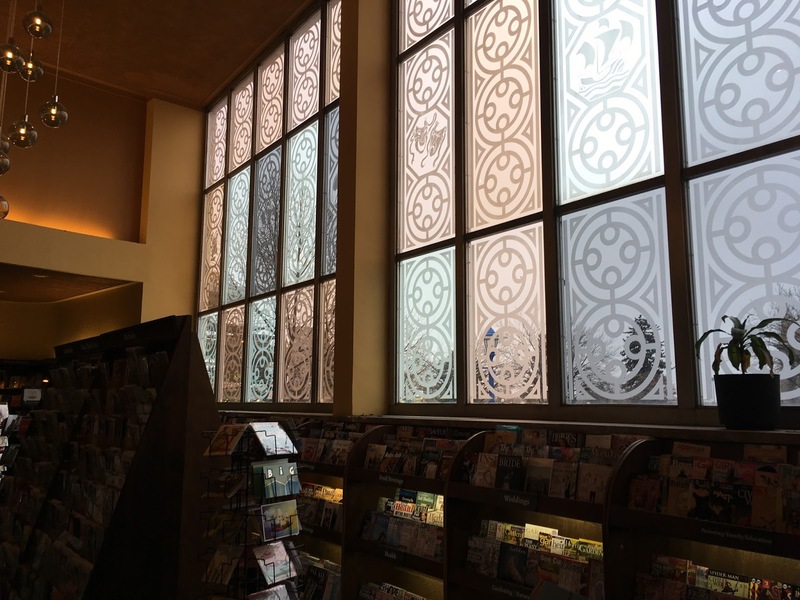 Right now we alternate between two locations: the legendary Tattered Cover Bookstore, at its stunning three-story, renovated-old-movie-theater site on Colfax Avenue, and the relatively new but already beloved Second Star to the Right children's-only bookstore on Tennyson Avenue. A different author presents each time, on some aspect of craft. So far I've heard Newbery-honoree Ingrid Law (Savvy) talk about writing a high-concept book, Lauren Sabel (Lies I Live By) on the multi-narrator book, Emily France (Signs of You) on what distinguishes young adult mysteries from their adult counterpart (note: it isn't literary sophistication or complexity of characterization or plot), and Jean Reidy (Too Purpley!, which I've read to granddaughter Kataleya approximately 523 times since this past Christmas) on resonance in picture books. Attendees pay no fee to attend, and authors receive no fee for presenting, but each attendee purchases (from the bookstore) a pre-ordered copy of one of the presenter's books, which of course we are all wild to read after hearing her craft presentation. It's like attending an MFA program in creative writing, for free, with classes taught by dear friends right in your own town. Yesterday it was my turn to present, so fourteen or fifteen authors gathered at the Rumpus Room in a little cottage behind Second Star to the Right to hear me talk on a topic dear to my philosopher-author's heart: "How to Write Ethically Charged Stories without Teaching or Preaching." Of course, my opening caveat was that I wasn't going to be offering clear, directive rules for how to do this, because they simply don't exist - at the very least, it's impossible to find any rule here that hasn't been broken - with brilliant success - by some of the greatest authors who ever put pen to paper. But I did promise - and I think I delivered - to generate a good discussion about which books we've read that did memorably convey a deep and beautiful moral truth to readers without falling into dictatorial didacticism. It was a joy to be able to share my thoughts on craft with writers I so respect and admire, hoping they might learn from me as I've learned from them. Look how happy I appear in this picture - and as I usually hate photos of myself, getting this one was an added bonus of a magical afternoon. For Christmas, I asked for - and received - a copy of the brand new (2016) biography of children's author/illustrator Lois Lenski: Lois Lenski, Storycatcher, by Bobbie Malone. 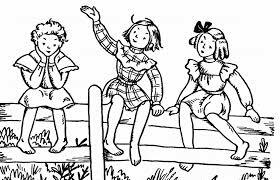 Lenski is best-known to Betsy-Tacy devotees - and I am nothing if not a Betsy-Tacy devotee - as the beloved illustrator of the first four books in the series: Betsy-Tacy, Betsy-Tacy and Tib; Betsy and Tacy Go Over the Big Hill; and Betsy and Tacy Go Downtown. But she is best known to just about everyone else as the creator of some 100 of her own books, most notably her "American Regional Series," exhaustively and intimately researched books that shared the stories of children from a wide range of hard-working backgrounds, including Strawberry Girl (1945, winner of the Newbery Medal), Cotton in My Sack (1949), Mama Hattie's Girl (1953), and Corn-Farm Boy (1954). I stumbled upon the biography only because of Lenski's Betsy-Tacy connection (I discovered it on the Betsy-Tacy Society website). It turned out that only ONE PAGE of the 323-page book discusses Lenski's Betsy-Tacy role. But the book was nonetheless mesmerizing in its portrait of this mid-20th-century author who pioneered the telling of untold stories, the hardships and small victories of America's neglected and marginalized children. Some of her titles, such as Cotton in My Sack, ensued from the actual invitation of school children for her to come live among them for a stretch of time to learn their stories - invitations that she was honored to accept. I was also struck powerfully by Lenski's struggles to maintain a balance between family and work at a time when it was an unquestioned requirement that women would put husband and children first. Lenski married her art-school mentor, Arthur Covey, a widower sixteen years her senior, father of two children in desperate need of a new mother; they also had an additional child together. "Your job is the home and the children. They come first." "But what about my work?" "That's up to you.. . You'll have to find time for it." What's amazing is that she did, even becoming the family breadwinner as commissions for his large-scale murals disappeared during the Depression years (and of course, she still had to prioritize home-making and care-giving, even as she earned virtually all of the family's income). She wrote of this conversation with her husband, which would have proved disheartening to so many: "His words, in putting the responsibility up to me, in offering me no aid in my struggle, helped me to realize that I was truly possessed by this creative demon and could not and would not give it up." 5. Definite purpose in life. Malone provides some additional details: "Ability to plan and organize" included saving the best hours of the day for her studio by relegating housework to the evenings - a good tip. But most of all, it seems to have been #5 on her list - her strong sense of art as a sacred calling - that explained her success. I am my family's chief breadwinner, and also a much-in-demand caregiver. Lenski reminds me that the responsibility for finding time for the work I love is, in the end, up to me. I guess I already knew that. My mantra has long been: "If it is to be, it's up to me." Malone's fascinating biography of Lois Lenski reminds me that, for better or worse, this mantra is as true as true can be. Today my son Christopher and I celebrated the dawn of 2017 by continuing a mother-son tradition of several years standing: we led worship at St. Paul's United Methodist Church here in Boulder, me as "preacher girl" presiding over the service and providing an inspirational new year's message, he at the keyboard playing for a congregational hymn sing. I'm always surprised to learn that not everyone loves a hymn sing as I do. Even one of our choir members, the one with the most glorious voice and biggest stage presence, said that hymn sings "aren't her favorite." One friend of mine, who attends a different church, claims to dread hymn singing. How can this be??! I'm a mediocre singer at best, but perhaps what I love best about being a regular church attender is the chance to sing, indeed, to belt out hymns confident that any wrong notes will be drowned by the swelling sound of the entire congregation singing together. Christopher can play anything in the United Methodist Hymnal by sight, so I invited people just to call out numbers. First up, in honor of the season, "We Three Kings of Orient Are." Then, because I had referenced this one to frame our prayer time, "It's me, it's me, oh Lord, standing in the need of prayer" (most rousing!). One member surprised us with a request we've never sung in our church before and I had never even heard before: "I Sought the Lord." Bold Christopher sailed through its four flats with aplomb. Then, as we are facing a new year that offers new challenges for our country and our world, two that almost brought me to tears: "Let There Be Peace on Earth (and Let it Begin with Me)"; and the moving African-American spiritual and anthem of the Civil Rights Movement, "We Shall Overcome." After we sang that last one, no one called out any other hymn numbers, even though most of us usually have endless favorites to request: it was such a perfect note to end upon. In this new year, I wish all of you health and happiness, work for your hands and love for your hearts. Welcome, 2017!